For proper maintenance, safety, and maximum fuel economy, you must always maintain recommended tire inflation pressures and stay within the load limits and weight distribution recommended for your vehicle. All tire pressures (including the spare) should be checked when the tires are cold. “Cold Tires” means the vehicle has not been driven for at least three hours or driven less than 1.6 km (one mile). attached to the driver’s side center pillar. WARNING - Tire underinflation Severe underinflation can lead to severe heat build-up, causing blowouts, tread separation and other tire failures that can result in the loss of vehicle control leading to severe injury or death. This risk is much higher on hot days and when driving for long periods at high speeds. • Underinflation also results in excessive wear, poor handling and reduced fuel economy. Wheel deformation also is possible. Keep your tire pressures at the proper levels. If a tire frequently needs refilling, have it checked by an authorized KIA dealer. • Overinflation produces a harsh ride, excessive wear at the center of the tire tread, and a greater possibility of damage from road hazards. psi). Do not release air from warm tires to adjust the pressure or the tires will be underinflated. • Be sure to reinstall the tire inflation valve caps. Without the valve cap, dirt or moisture could get into the valve core and cause air leakage. If a valve cap is missing, install a new one as soon as possible. WARNING - Tire Inflation Overinflation or underinflation can reduce tire life, adversely affect vehicle handling, and lead to sudden tire failure. This could result in loss of vehicle control and potential injury. • Check the pressure of your spare tire each time you check the pressure of other tires. • Never overload your vehicle. Be careful not to overload a vehicle luggage rack if your vehicle is equipped with one. • Worn, old tires can cause accidents. worn, or if your tires have been damaged, replace them. Checking tire inflation pressure Check your tires once a month or more. Check the tire's inflation pressure when the tires are cold. - "Cold" means your vehicle has been sitting for at least three hours or driven no more than 1.6 km (1 mile). found in this manual and on the tire label located on the driver's side center pillar. • Worn tires can cause accidents. worn, show uneven wear, or are damaged. recommends that you check the spare every time you check the pressure of the other tires on your vehicle. To equalize tread wear, it is recommended that the tires be rotated every 12,000 km (7,500 miles) or sooner if irregular wear develops. When rotating tires, check for uneven wear and damage. Abnormal wear is usually caused by incorrect tire pressure, improper wheel alignment, outof- balance wheels, severe braking or severe cornering. Look for bumps or bulges in the tread or side of tire. Replace the tire if you find either of these conditions. Replace the tire if fabric or cord is visible. After rotation, be sure to bring the front and rear tire pressures to specification and check lug nut tightness. • Do not use the compact spare tire (if equipped) for tire rotation. • Do not mix bias ply and radial ply tires under any circumstances. unusual handling characteristics that could result in death, severe injury, or property damage. Wheel alignment and tire balance The wheels on your vehicle were aligned and balanced carefully at the factory to give you the longest tire life and best overall performance. If the tire is worn evenly, a tread wear indicator will appear as a solid band across the tread. This shows there is less than 1.6 mm (1/16 inch) of tread left on the tire. Replace the tire when this happens. • Do not drive your vehicle with too little or too much pressure in your tires. This can lead to uneven wear and tire failure. • When replacing tires, never mix radial and bias-ply tires on the same car. 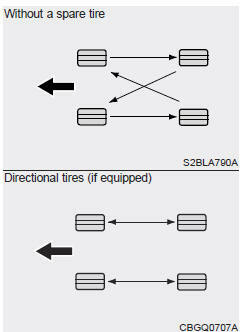 You must replace all tires (including the spare) if moving from radial to bias-ply tires. • Using tires and wheels other than the recommended sizes could cause unusual handling characteristics and poor vehicle control, resulting in a serious accident. • Wheels that do not meet KIA’s specifications may fit poorly and result in damage to the vehicle or unusual handling and poor vehicle control. • The ABS works by comparing the speed of the wheels. The tire size affects wheel speed. (Anti-lock Brake System) and ESC (Electronic Stability Control) to work irregularly. Compact spare tire replacement A compact spare tire has a shorter tread life than a regular size tire. Replace it when you can see the tread wear indicator bars on the tire. The replacement compact spare tire should be the same size and design tire as the one provided with your new vehicle and should be mounted on the same compact spare tire wheel. The compact spare tire is not designed to be mounted on a regular size wheel, and the compact spare tire wheel is not designed for mounting a regular size tire. Tire sidewall labeling This information identifies and describes the fundamental characteristics of the tire and also provides the tire identification number (TIN) for safety standard certification. The TIN can be used to identify the tire in case of a recall. 2. Tire size designation A tire’s sidewall is marked with a tire size designation. You will need this information when selecting replacement tires for your vehicle. The following explains what the letters and numbers in the tire size designation mean. 17 - Rim diameter in inches. 7.0 - Rim width in inches. Any tires that are over 6 years old, based on the manufacturing date, (including the spare tire) should be replaced by new ones. You can find the manufacturing date on the tire sidewall (possibly on the inside of the wheel), displaying the DOT Code. The DOT Code is a series of numbers on a tire consisting of numbers and English letters. The manufacturing date is designated by the last four digits (characters) of the DOT code. DOT XXXX XXXX 1609 represents that the tire was produced in the 16th week of 2009. Regardless of the remaining tread, we recommend that tires be replaced after approximately six (6) years of normal service. Heat caused by hot climates or frequent high loading conditions can accelerate the aging process. Failure to follow this warning can result in sudden tire failure, which could lead to a loss of control and an accident involving serious injury or death. 4. Tire ply composition and material The number of layers or plies of rubber- coated fabric in the tire. Tire manufacturers also must indicate the materials in the tire, which include steel, nylon, polyester, and others. The letter "R" means radial ply construction; the letter "D" means diagonal or bias ply construction; and the letter "B" means belted-bias ply construction. These grades are molded on the side-walls of passenger vehicle tires. The tires available as standard or optional equipment on your vehicle may vary with respect to grade. Traction - AA, A, B & C The traction grades, from highest to lowest, are AA, A, B and C. Those grades represent the tire’s ability to stop on wet pavement as measured under controlled conditions on specified government test surfaces of asphalt and concrete. A tire marked C may have poor traction performance. and does not include acceleration, cornering, hydroplaning, or peak traction characteristics. Temperature -A, B & C The temperature grades are A (the highest), B and C representing the tire’s resistance to the generation of heat and its ability to dissipate heat when tested under controlled conditions on a specified indoor laboratory test wheel. Tire terminology and definitions Air Pressure: The amount of air inside the tire pressing outward on the tire. Air pressure is expressed in kilopascal (kPa) or pounds per square inch (psi). Some examples of optional accessories are, automatic transaxle, power seats, and air conditioning. Cold Tire Pressure: The amount of air pressure in a tire, measured in kilopascals (kPa) or pounds per square inch (psi) before a tire has built up heat from driving. DOT Markings: The DOT code includes the Tire Identification Number (TIN), an alphanumeric designator which can also identify the tire manufacturer, production plant, brand and date of production. Normal Occupant Weight: The number of occupants a vehicle is designed to seat multiplied by 68 kg (150 pounds). UTQGS: Uniform Tire Quality Grading Standards, a tire information system that provides consumers with ratings for a tire's traction, temperature and treadwear. Ratings are determined by tire manufacturers using government testing procedures. The ratings are molded into the sidewall of the tire. Vehicle Capacity Weight: The number of designated seating positions multiplied by 68 kg (150 lbs.) plus the rated cargo and luggage load. including snowy and icy road conditions. All season tires are identified by ALL SEASON and/or M+S (Mud and Snow) on the tire sidewall. Snow tires have better snow traction than all season tires and may be more appropriate in some areas. KIA specifies summer tires on some models to provide superior performance on dry roads. Summer tire performance is substantially reduced in snow and ice. Summer tires do not have the tire traction rating M+S (Mud and Snow) on the tire side wall. if you plan to operate your vehicle in snowy or icy conditions. KIA recommends the use of snow tires or all season tires on all four wheels. Snow tires should carry 28 kPa (4 psi ) more air pressure than the pressure recommended for the standard tires on the tire label on the driver's side of the center pillar, or up to the maximum pressure shown on the tire sidewall, whichever is less. 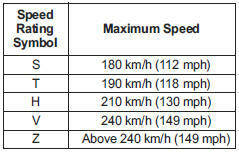 Do not drive faster than 120 km/h (75 mph) when your vehicle is equipped with snow tires. Radial-ply tires provide improved tread life, road hazard resistance and smoother high speed ride. The radial- ply tires used on this vehicle are of belted construction, and are selected to complement the ride and handling characteristics of your vehicle. Radial-ply tires have the same load carrying capacity, as bias-ply or bias belted tires of the same size, and use the same recommended inflation pressure. Mixing of radial-ply tires with bias-ply or bias belted tires is not recommended. Any combinations of radial-ply and bias-ply or bias belted tires when used on the same vehicle will seriously deteriorate vehicle handling. The best rule to follow is: Identical radial-ply tires should always be used as a set of four.